The first thing I should say is that if you buy this book, you will be supporting a good cause, because all the author’s royalties are being donated to the CRY charity (Cardiac Risk in the Young), Tony Baws’ son having died unexpectedly at 33 from an unsuspected heart condition. The second thing is that this is not exactly your standard fishing yarn and it is all the better for it: the eponymous Harry is a high class biscuit salesman and this is the story of his fishing adventures with the young lad who sets out to marry his step-daughter. Set against the background of the sixties, the publisher’s blurb describes this as “a book not just for anglers but for anyone who enjoys a finely-told story”, but the bottom line is that the text is wall-to-wall fishing and the love interest pretty vestigial, but I’ll go with the finely-told bit. What kind of fishing? 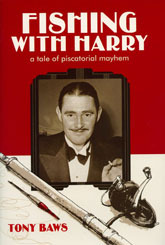 Most of Harry and Tony’s sorties are at night, in the ponds in and around Essex and the near side of London, with an expedition to France, where Tony goes fishing on his honeymoon. The story is nicely set in the period, as the pair chase carp, roach, rudd and bream by bus, Lambretta, Ford 10, 1100 and Lotus Cortina, so sixties car enthusiasts will be in their element. The characters are convincing and even if there is no great denouement, the best compliment I can pay to the author is that if you enjoy Waterlog, you will enjoy Fishing with Harry.